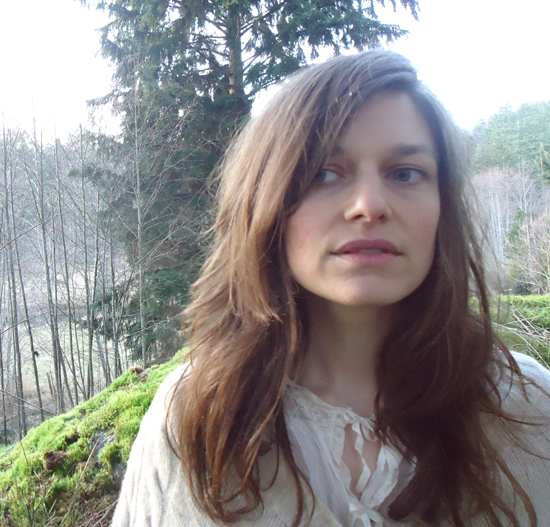 The ever-elegant voiced Miss Emily Brown will be releasing a new EP, “Wire Wood Wind”, on March 13. It’s a sort of way to raise money to acquire a new autoharp after her heirloom was stolen. The new experimental record is a collaboration with Martyn Heyne (Efterklang, Gyda Valtysdottir) — who if based on the wanderlust single, “Back to the Woods”, provides a textured sonic sound as accompaniment to Emily’s satiny swaying. If we take the album title and the opening lyrics of the single,“Back to the woods, the spell has been broken …”, there’s a sense this record could be an escape into a more solitary, personal sound. “Back to the Woods” feels like the beautiful melding of natural elements with electronic soundscaping. Emily’s emotive singing style and soul-searching autoharp chords melt like icing over the top of a dark tremor, twittering electronics, and sonar-like reverb. It’s a stunningly moving combination, that teems with fragility under it’s calming veneer. If you pre-order the album now (before March 22) you can get your copy signed by Miss Emily Brown herself. Click here to go to her website for more details. She’s just set up atwitter account, so be sure to follow her there and at facebook. You can stream “Back to the Woods” courtesy of CBCMusic’s website here. Note: Photo from artist’s official website, taken by Orion Cleasby. – David D. Robbins Jr.
Wire Wood Wind: New Album and Autoharp Roadtrip! As many of you may already know, my beloved autoharp was stolen this summer never to be recovered. I spent four months combing pawn shops and craigslist for something to replace that old 70’s relic Jess Brown found in his grandmother’s closet. Nothing sounded nearly as good. Miss Brown has begun her tour of Germany supporting the amazing Alin Coen Band! Hear their music HERE! Miss Emily Brown Nominated for a CBC Radio Bucky Award for Best New Artist! Fans decide the winner with votes, so please VOTE! Sum of All Parts EP Now Available! In Technicolor nominated for a 2010 Canadian Folk Music Award for “Pushing the Boundaries”! More info HERE. Chills go down my spine when I listen to Miss Emily Brown’s album, “Part Of You Pours Out Of Me.” When I hear it, I am swept away to this far off land of shrouded mystery where any kind of musical idea is possible. Music box, autoharp, pianet, and a few other ever-so-slightly out of tune instruments play prominent roles in her songs. Her ethereal vocals deliver lyrics straight out of a Rainer Maria Rilke collection to form this swirling murk, deep and dark, feeling very familiar in an unsettling, cold rainy day sort of way. I’m beginning to think Emily isn’t even a real person. Try listening to this with the lights out for a really great ghost story, or while aboard a rickety paddle boat going through a foggy Louisiana bayou to visit a haunted mansion. Flowered wallpaper, little-known Catholic observances and wartime longing—things and feelings pretty far removed from most young musicians, including Emily Millard. But Millard, who performs under the name Miss Emily Brown, explores them all on her new album, In Technicolor. It’s a gorgeous album, with warm acoustic and electronic sounds, with Millard’s effortless soprano colouring in her clever but heartful folk songs. Stylus exchanged electronic letters with Millard during her current tour, which stops in Winnipeg on April 19 at Mondragon. Stylus: You used your grandmother’s wartime diary as inspiration for the songs on this album. What drew you to choosing an artifact and using it for inspiration in this way? Is your songwriting process different when you do it this way? Please also have a listen to my band, Morlove.